Standing 60 inches in height when fully extended vertically, Brightech's Contour Flex LED Reading Floor Lamp boasts the added advantage of EverBrite Technology. Your lamp burns brighter, longer, and smarter. Our built-in LED lighting fixture endures for more than 20 years and never loses the full spectrum impact of its brightest setting. Throughout the lifespan of this lamp, you'll never need to replace the energy-saving 9-watt bulb. Unlike incandescent table lamps, the LED Contour Flex doesn't generate heat; it stays safely cool to the touch, even after being on for several hours. 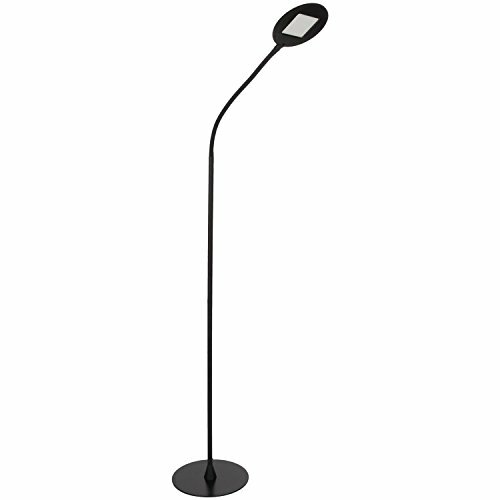 Designed with a reader's needs in mind, this LED lamp with an adjustable gooseneck produces a bright, crisp light that makes it easier to see fine print clearly. The versatility of your new floor lamp makes it indispensable for bedside reading. You can contour the lamp head 360 degrees in any direction, shining it directly on a book or magazine and away from your slumbering spouse. You'll find the on/off switch on the lamp's colorful red power cord, and best of all, there's a built-in rotary dimmer dial for softening or intensifying the light. For example, if you have the floor lamp in your living room, you'll discover how easy it is to reach down from your armchair to adjust the dimmer switch. Because of the Contour Flex Reading Lamp's slender, ultra-modern design, it positions unobtrusively into any corner of your study, craft room, or townhouse. An ultra-slim, all-black body connects a weighted round base to a shaded orb-like light source in this futuristically minimalist LED floor lamp. The base slides conveniently under a nightstand or desk. Foam on the base prevents scratching of hardwood floors. The adjustable gooseneck stays in place without drooping, as the enclosed LED fixture beams bright white light for thousands of enjoyable hours. PERFECT LAMP TO ILUMINATE READING OR HOBBIES: The Contour Flex LED Reading Floor Lamp is the perfect lamp to illuminate your reading, knitting, arts, crafts, woodworking, and hobbies brightly and efficiently. This lamp is perfect in your bedroom, den, craft room, hobby room, dorm, garage, or office to give you sufficient light to complete your work without needing a ceiling light. Its adjustability and dimmable features allow you to position the light perfectly for your reading and hobbies. CONVENIENT ADJUSTABLE & DIMMABLE FLOOR LAMP: This LED floor lamp has a flexible yet sturdy gooseneck that can be adjusted 360 degrees and will pivot in any direction so that you can position the light perfectly and it will stay put exactly where you position it. Its built in rotary dial allows you to set the light according to your task or mood. Use the highest setting for work and tasks in your office or dorm and the lowest setting for a comfortable mood in your family room or bedroom. BRIGHT, LONG LASTING, & ENERGY SAVING: The Brightech Contour LED Flex Reading Floor Lamp includes a 9 Watt power saving integrated LED light so that you will never have to replace a bulb. Its advanced 5,000K daylight LED technology with 600 lumens allows this lamp to outshine lamps that depend on short lived, energy consuming standard halogen or incandescent bulbs. This LED lighting will endure for more than 20 years without burning out or overheating. Save money & energy with this Floor Lamp. COOL TO THE TOUCH, SAFE, & STURDY: This LED floor lamp will never overheat & stays cool to the touch so that you can easily reposition the light without any discomfort, and it doesn't give off any heat which keeps your space from overheating. It stands about 5 feet tall and is lightweight so that you can easily move it around to where you need light the most. Its weighted base & sturdy design make it wobble free and safe to have around children and pets because it will not easily tip.